BitDefender Antivirus 10 is a powerful antivirus and antispyware tool with features that best meet your security needs. Ease of use and automatic updates make BitDefender Antivirus an ‘install and forget’ product . The purpose of the antivirus module is to ensure detection and removal of all viruses in the wild. 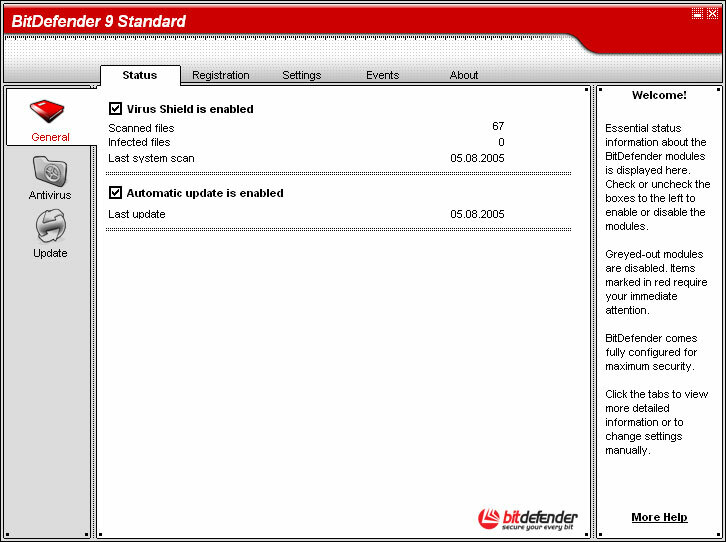 BitDefender Antivirus uses robust scan engines certified by ICSA Labs, Virus Bulletin, Checkmark, CheckVir and TÜV. BitDefender monitors and prevents potential spyware threats in real-time, before they can damage your system. By making use of a comprehensive database of spyware signatures, it will keep your computer spyware-free. B-HAVE (Behavioral Heuristic Analyzer in Virtual Environments) emulates a virtual computer-inside-a-computer where pieces of software are run in order to check for potential malware behavior. This BitDefender proprietary technology represents a new security layer that keeps the operating system safe from unknown viruses by detecting malicious pieces of code for which signatures have not yet been released. The new and improved BitDefender scanning engines will scan and disinfect infected files on access, minimizing data loss. Infected documents can now be recovered instead of being deleted. A new BitDefender module looks for rootkits (malicious programs designed to control victim computers, while staying hidden) and removes them on detection. Web traffic is now filtered in real-time even before reaching your browser, providing a safe and enjoyable web experience. Filters against viruses that spread via instant messaging and file sharing software applications. BitDefender runs on the POP3/SMTP protocol level, filtering incoming and outgoing e-mail messages, regardless of the e-mail client used (OutlookTM, Outlook ExpressTM, The Bat!TM, Netscape®, etc. ), without any additional configuration. BitDefender monitors dozens of potential “hotspots” in your system where spyware might act, and also checks any changes made to your system and software. Known spyware threats are also blocked in real-time. BitDefender can scan your entire system, or just part of it, for known spyware threats. The scan uses a constantly updated spyware signature database. The privacy guard monitors HTTP (web) and SMTP (mail) traffic flowing out of your computer for what might be personal information –such as credit card numbers, Social Security numbers and other user-defined strings (e.g. bits of passwords). A configurable anti-dialer prevents malicious applications from running up a huge telephone bill at your expense. The antispyware component filters incoming and outgoing cookie type files, keeping your identity and preferences confidential when you’re browsing the Internet. Proactively blocks any potentially malicious application such as: ActiveX, Java Applets or Java Scripts type codes. A setup wizard starts immediately after installation, helping users select the most appropriate update settings, implementing a scanning schedule and providing a quick path to the registration and activation of the product. BitDefender has redesigned the user experience, placing emphasis on ease of use and clutter avoidance. As a result, many BitDefender v10 modules require significantly less user interaction, through the convenient use of automation and machine learning. Your copy of BitDefender will be updated 24 times a day over the Internet, directly or through a Proxy Server. The product is able to repair itself, if necessary, by downloading the damaged or missing files from BitDefender servers. Offered online by qualified support representatives and by accessing an online database with answers to Frequently Asked Questions. BitDefender Antivirus v10 is delivered on a bootable CD. This CD can be used to analyze/repair/disinfect a compromised system which cannot be started.